I am a volunteer crew member on the Christine -- the oldest Oyster Sloop in America. This 50' gaffer is commanded by Captain Pete, who likes everything ship-shape and Bristol fashion. This summer, the Christine was sporting a brand-new set of sail ties, and as soon as I laid eyes on them, I realized that I'd been making due on the Blue Moon with an sad collection of old scraps: odd lengths of frayed rope, a couple of ragged bungee cords that had long lost their spring, and a knotted strip of cloth that must have been salvaged by a previous owner from a drowned kite. In contrast, the Christine's new sail ties looked like they'd been hand-crafted by a master rigger. Sail-tie envy burned in my breast. I had to have a set, just like them! Captain Pete knew, of course, that gaskets ('sail tie' and 'sail stop' are relatively recent names) are traditionally made from rope. A proper gasket has an eye spliced into one end. On a square rigger, the eye is hitched to the jackstay (the metal rod in the photo above). The gasket is looped around the sail and tied off with a Slippery Hitch. No, the Christine's sails are not pastel colored. The same style of gasket would work perfectly on the Blue Moon, I thought, so I resolved to make a set for the Blue Moon's main and staysail. One problem: like many sailors who grew up on shiny fiberglass boats, I never learned how to splice an eye. All the lines on the boats I grew up with -- except for lowly dock lines -- were made out of fancy yacht braid. I guess it's possible to splice this stuff, but in my un-handy, fiberglass sailing days, it never even occurred to me. The builder of the Blue Moon, on the other hand, used 3-strand line for everything, and top-quality Dacron to boot. The two halyards that are still on the boat have turned a mellow shade of gray, but are in great shape and feel wonderful in the hand. Unfortunately, some of the original lines have gone missing and were replaced (by previous owners) with double-braided line. Yuck. They just don't look right and I am gradually replacing them, as time and money allow. 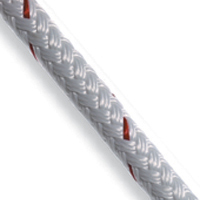 There are a number of traditional-looking 3-strand ropes on the market, including Spunflex©, which is used on the Christine, and Hempex©, which I admired at the Wooden Boat Show this year. Weathered Spunflex looks and feels great. The halyards on the Christine must be 10 years old or so, and they feel like old-fashioned hemp lines. But brand new Spunflex is a bit too stiff and shiny for my taste. 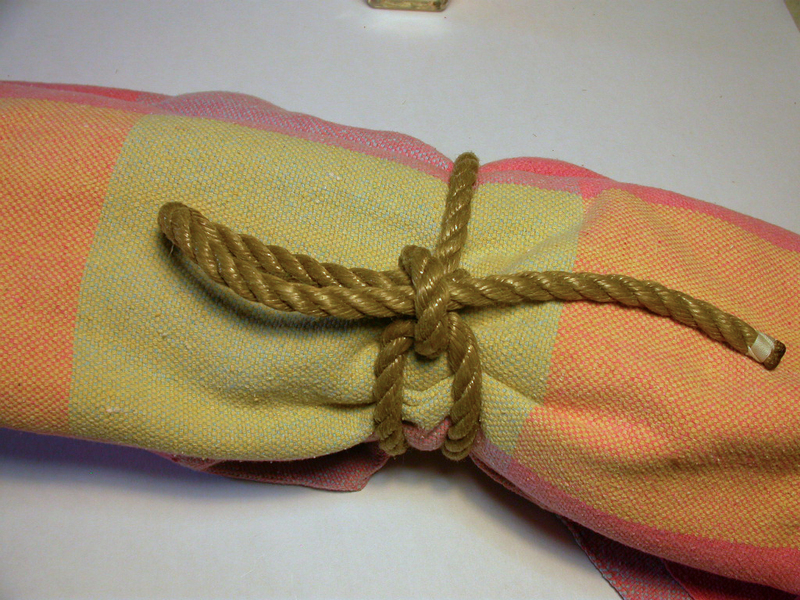 I'm using it as halyards for my staysail and jib, but I'm not super-happy with it, so far. Talk to me in 10 years, I guess. I'm going to be evaluating Hempex and a number of other 'lines for traditional boats' in the coming months... stay tuned. Anyway, I had a good length of Spunflex kicking around the shop, and now I had a good use for it. 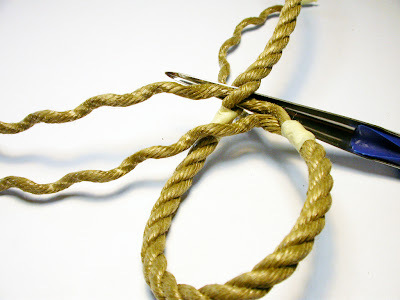 I found an excellent eye-splicing tutorial on the New England Ropes website, bought a very non-traditional looking fid, and sat down to figure out how to splice, finally. I won't turn this blog post into a tutorial... the Web is already awash with how-to-tie-a-knot tutorials, but I will make several remarks on the process. 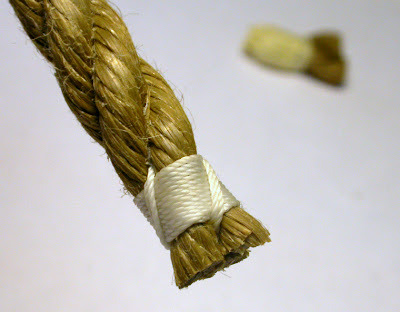 First, you don't need many tools to splice a 3-strand rope, but you do need a fid, or something that can pry an opening under the strands. For ages, I've been meaning to make a nice wooden one, like those below, but somehow I never got around to it. The only fid available at my local West Marine was made of metal with a blue plastic handle. I'm sure you've seen them. Kinda ugly. Even worse, they weren't round like a traditional fid. Instead, they were hollow, like a pointy ice-cream scoop. I stood in the store trying to figure out how it could possibly work, but couldn't quite imagine it. I bought it anyway. After inserting the fid under one of the strands, the fid's hollow makes a little tunnel through which you can pass one of the unlaid strands. Neat! It took about an hour to go through the splicing tutorial the first time. It was easier than I expected and my first eye splice looked pretty darn good. The second splice took about 1/2 hour and looked even better. I can now do them in about 10 minutes. It's really easy and I'm sorry I didn't learn years ago. I could have put a butane whipping on the straight end of the gasket, but was so pleased with my eye splice that I decided to put an sailmaker's whipping on it. I actually chose this style whipping because I dropped my whipping needle overboard back in Tarpon Springs. I didn't fancy a trip back to West Marine (of course, forgot to buy one while I was there), so found this whipping method on the Web. No needle required, it's much better than the quick whipping I usually do, and looks ship-shape. Captain Pete would be proud. Whipped & spliced gasket -- about 3.5 foot long. About $2 for the rope, plus 10 minutes of my time. Not bad, considering they will probably last a lifetime. At least my lifetime. 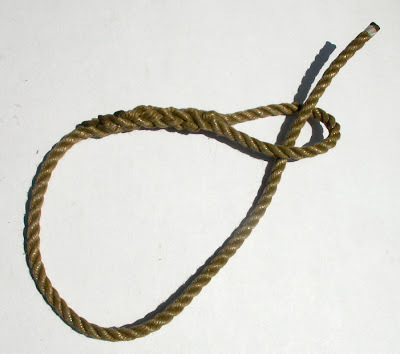 Plus it's nice to finally know how to put in an eye splice. I'm sure I'll find all sorts of uses for it. Now if I can just finish this darn programming job and get back to the Blue Moon. I'm really enjoying your blog. Thanks. It's inspiring me on to get sailing. I'm lusting after a Montgomery 17 which I'd be able to trailer all over the place and yet be pretty economical. Although there is a really old Blue Moon(the original one and free) but is probably a real rot bucket. Then there's the one for sale in Maine for $78k. Not to mention high moorage costs for that bowsprit and boomkin! Yes, there are a number of amazing Blue Moons out there. There's a Turkish company that is building real gold-platers. Re: the Montgomery 17... you can't go wrong with any Lyle Hess boat. They're great! 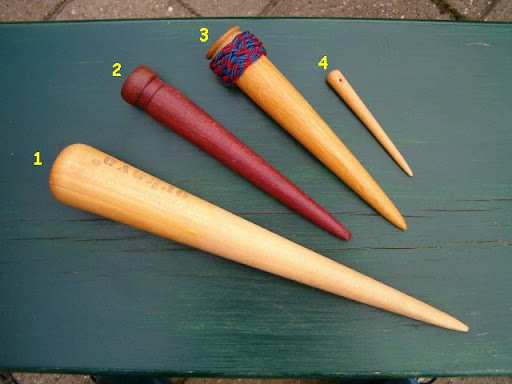 Made a fid (we called it a marlin spike) of Ash 50 years ago while a Boy Scout, much like your #1 in the picture, to splice hemp ropes. I still have it and use it once in a great while today. I think I'll make one with the hollow groove in it just to try it out. I have always whipped the rope ends and still whip the ends of the 'plastic' lines today. I'll try the 'sailmakers whip' next time. Have not seed it before. Stumbled upon your blog yesterday. Read every word. As it happens, I too now have a small gaff yawl (wooden spars but fibreglass hull, I'm afraid) so your blog is a particularly interesting read. Cool! Thanks for adding it to Wikimedia Commons. A great resource. Did I get the gasket thing right? Yep - and the picture of your spliced one looks exactly like what we keep a few of hanging inside the fo'c'sle hatch on the ship. We use a similar "plastic hemp" line. They are great, right? I need to make a few more, including some 8 or 10 footers. They come in handy for all sorts of things.